De Boer Staal is a renowned wholesale distributor with large stocks of sheet steel and profiles which are mainly used in the shipbuilding industry and specialises in profiling, cutting steel and stainless steel, cutting welding edges at a range of angles and cutting steel strips to size and bevels. We have an in-house coating line that can blast steel plates and profiles of more than three meters wide and coat them with one of several types of two-component shop primers that meet the requirements of IMO PSPC, the International Maritime Organization Performance Standard for Protective Coatings. De Boer Staal specialises in complete shipbuilding kits. With our large stocks of shipbuilding steel, specialist cutting and forming skills and in-house coating possibilities, we can meet your requirements. Organisation of the logistical process is of great importance if these shipbuilding kits are to be delivered to the shipyards on a just-in-time basis. De Boer Staal has had special three-metre wide flat racks made for this purpose. The pieces are cut to size, then packed flat on these racks in the exact sequence required. Moreover, the flat racks have both lifting eyes spaced three metres apart, and feet so they can be hoisted from the lorry at the shipyard and transferred straight to the assembly hall. The individually-marked items can then be taken piece-by-piece from the flat racks and welded to the vessel under construction in the right sequence. 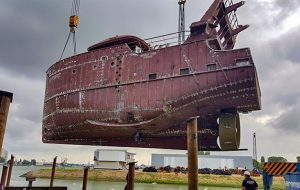 This service offered by De Boer Staal gives shipyards maximum flexibility.